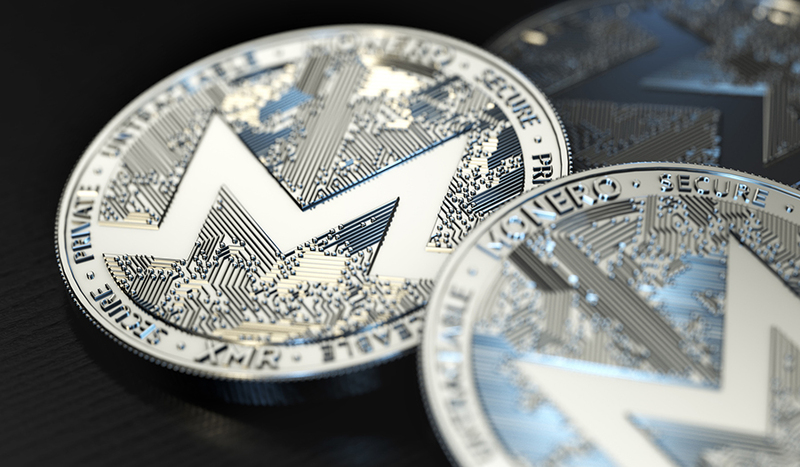 In the face of a proposed ban on anonymous cryptocurrencies by French Financial Regulators, the privacy coin Monero (XMR) for the first time shows signs of a trend reversal to the upside, as it trades above March’s opening price. Starting with the monthly time frame, as usual, we’ll be taking a look at the major technical driving patterns of the pair. 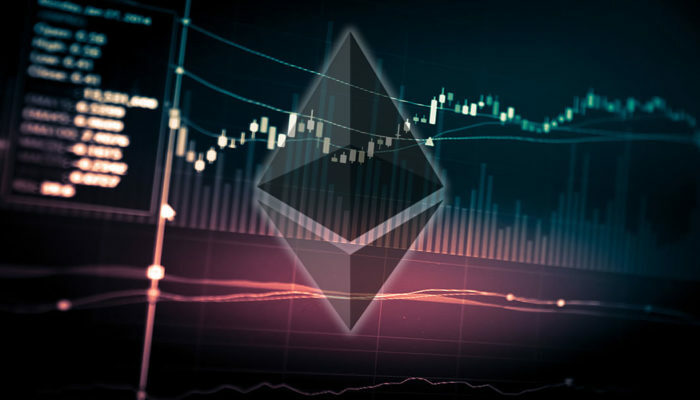 For more crypto technical analysis you can visit Cryptocointrade. 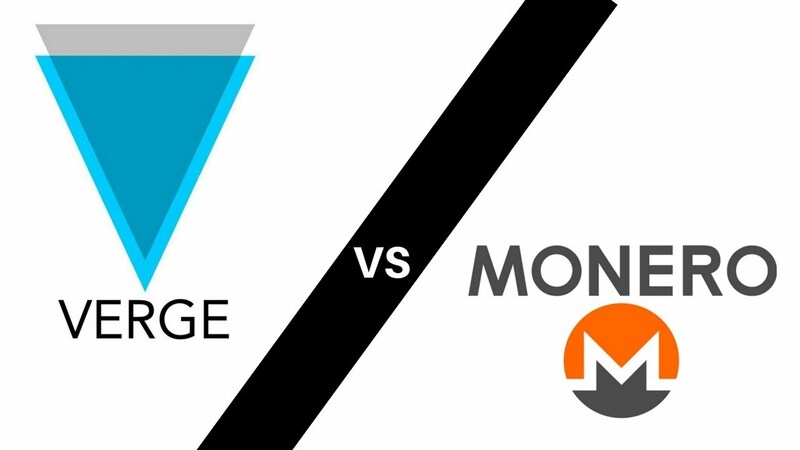 Let’s go on a way back machine to 01 March ’17 where the price of Monero (XMR) breaks through a bearish accumulation, prepping the pair for a long term bullish swing. Fast forward by three months from the first price breakout, the pair triggers a bullish accumulation pattern on June ’17, and another breakout of bearish accumulation on November ’17. 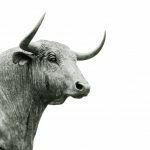 The pair rallied by approximately 2325.5% from the initial breakout of bearish accumulation; 952.10% from the bullish accumulation; and 171.53% from the last breakout of bearish accumulation in 2017. At the closing price of the month of May ’18, the pair breaks below a hidden inside bar which led to a 73.6% price decline. 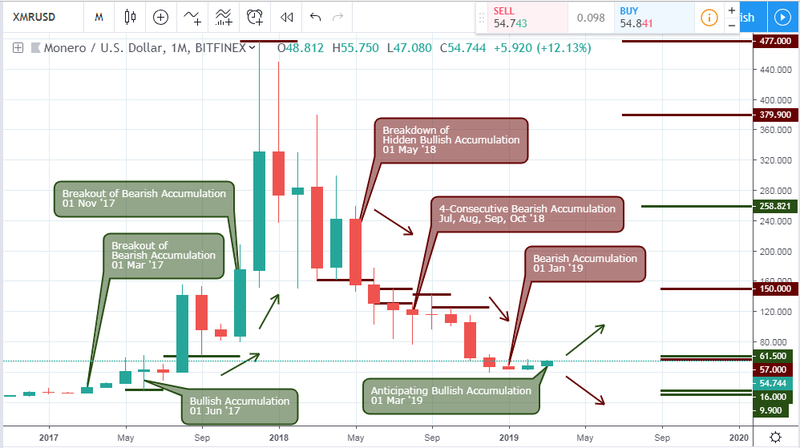 The initial price breakdown quickly transitions into 4 consecutive bearish accumulation patterns which ranged from July, August, September, October ’18. A buildup of bullish regular divergence on the weekly chart started from a breakdown of bullish accumulation patterns on 09 & 30 July ’18; and 08 October ‘18. The MACD oscillator triggers a higher low compared to the lower low of a price and later confirmed by a bullish accumulation pattern on 21 January ’19. 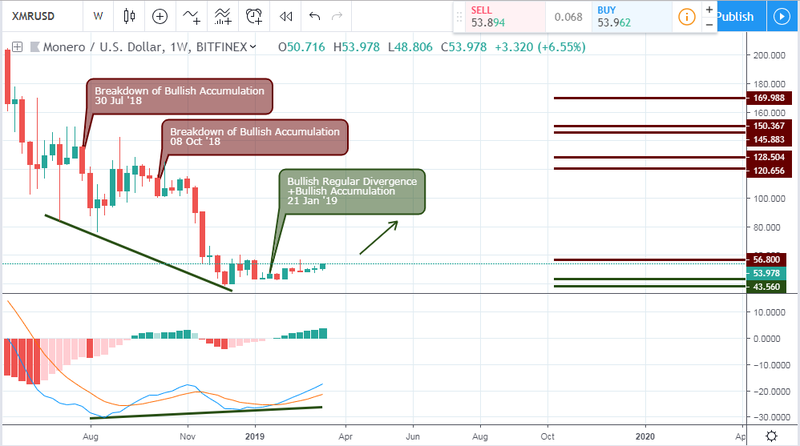 An early breakout of bearish accumulation on 05 February ’19 served as confirmation of the bullish regular divergence, resulting to a burst in volatility and price increase of about 29.3%. 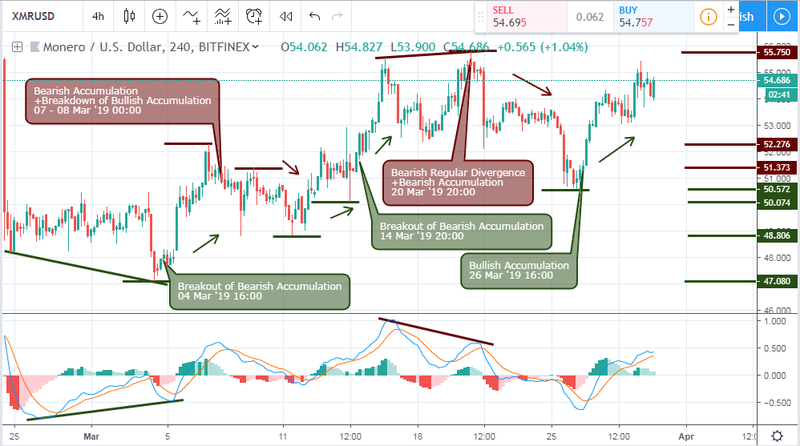 A view from the 4hour chart also kicked off with a bullish divergence in combination with a breakout of bearish accumulation on 04 March ’19 16:00 for a 16.0% price increase. 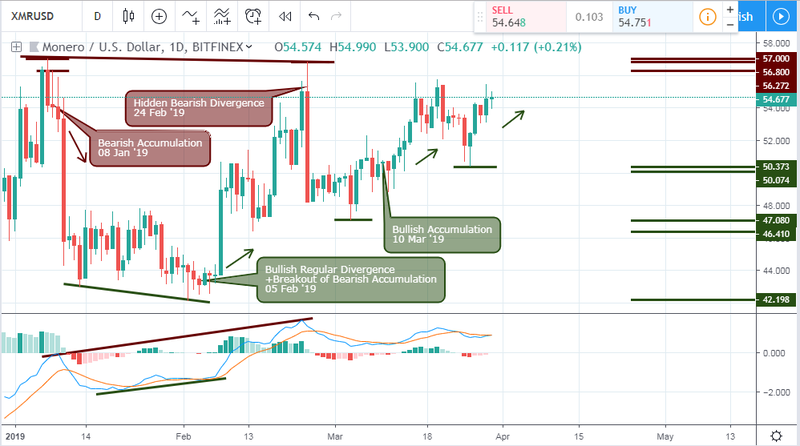 On 20 March ’19 20:00, the pair triggered a bearish accumulation pattern as confirmation to the bearish regular divergence, sending the price south by 8.4%. 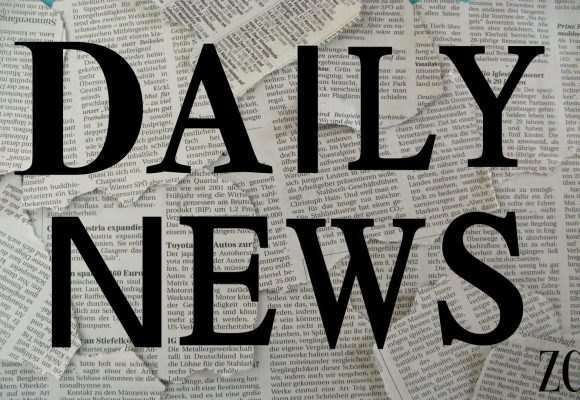 The bullish accumulation pattern triggered on 26 March ’19 16:00 confirmed the bullish rally with strong support at 50.572 and 50.074 respectively. Lastly, the above 2hour chart gives an illustration of the pair breaking below a rising channel which was formed by bullish and bearish divergence patterns on 19 March ’19 08:00, and 20 March ’19 22:00. The pair entered into a 4.22% bullish rally and later collapsed by 5.86% after the bearish divergence. 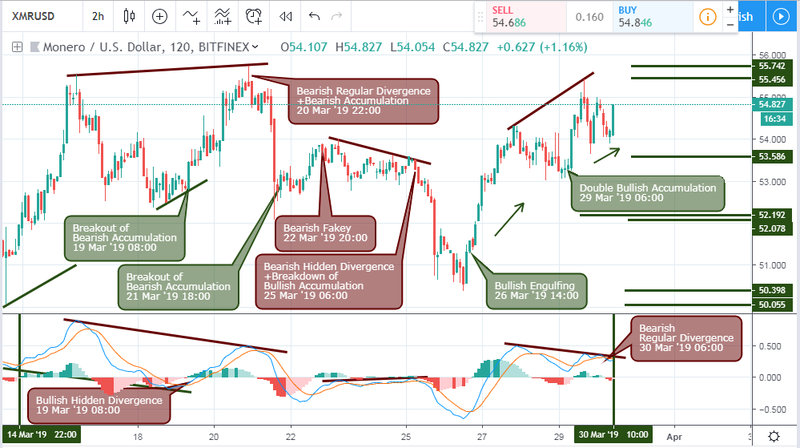 Following a retracement of the bearish trend on 21 March ’19 08:00, the pair resumed the bearish trend, this time with a bearish hidden divergence pattern in combination with bullish accumulation on 25 March ’19 06:00 for a 5.4% price drop. The XMRUSD generally maintains a strong bullish outlook on the weekly, daily, 4hour and 2hour time frames, as it threatens to close beyond the 57.0 resistance. There are 2 possible scenarios for confirmation of bullish trend on the monthly chart. Most significant is a break above the 57.0 resistance, and the second being a bullish accumulation pattern from price closing within the high low range of February. 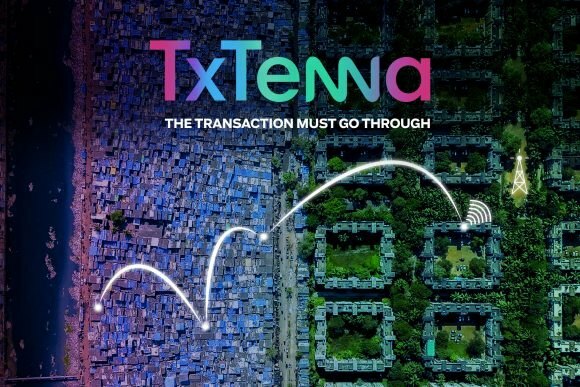 Did you like this crypto technical analysis? 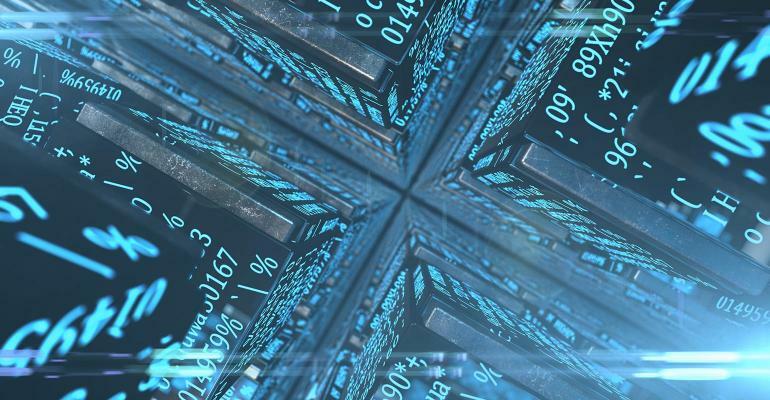 Visit Cryptocointrade for more Bitcoin and altcoin technical analysis.